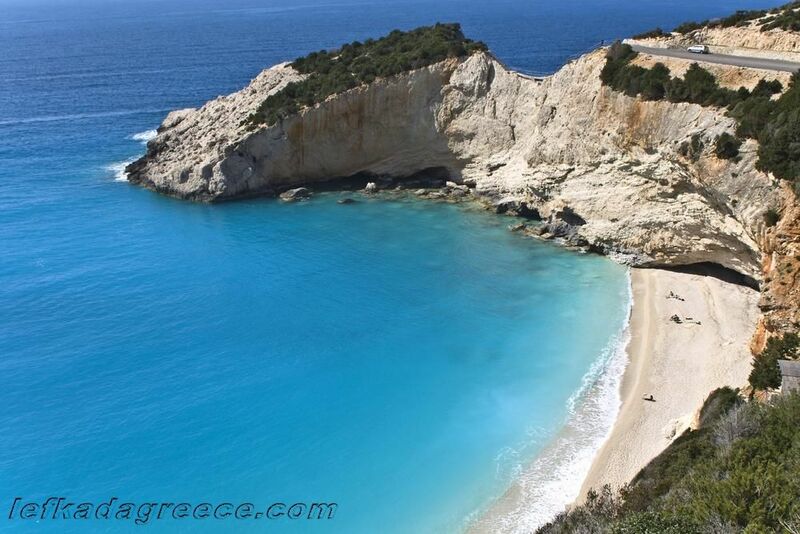 Porto Katsiki beach on Lefkada Island is one of the most beautiful Greek beaches. It is also in the top of the list of best beaches in Europe each year. It is situated 40 kilometers southwest of Lefkada Town, the island’s capital city. Porto Katsiki beach looks truly fascinating surrounded by incredible hills which make it accessible only by 80 steep steps descending along the cliff. This is one of the most favorite beaches and it is considered to be one of the island’s major attractions. Porto Katsiki owes its fame to fascinating landscape and most of all, crystal clear blue sea. Golden sandy beach adds a beauty to the overall impression of Porto Katsiki. Driving to the beach from island’s villages is not so convenient experience, since the road is pretty narrow and there is hardly space to fit two cars side by side on its main part. In addition, the traffic is heavy during summer period, especially in July and August. Tourists should be aware that there is no gas stations between Porto Katsiki beach and Lefkada Town, so fill up before you go to the beach, just in case. Don’t forget that the beach has a lot of stairs to walk down and climb up to the parking lot, which many visitors see as the main drawback of this beach. You can also reach the beach by taxi-boats from the villages of Nidri and Vassiliki. The long Porto Katsiki beach offers lots of room for laying under the sun or for different beach and water activities like swimming, sailing, body boarding or even surfing. But, this beach maybe isn’t the best setting for for snorkeling. The soft limestone rocks under the water giving it a fascinating tone, but making it very difficult to see beyond one or two meters beyond your mask. There is a car parking available as well as snack bars on the top of the stairs. There are sunbeds and umbrellas available for rent on the beach. You’ll have to bring own gear and equipment needed for water activities with you, because there isn’t any available on the beach. There aren’t lifeguards on duty on Porto Katsiki beach, so be careful, especially during the afternoon hours when the waves became especially large. If you come with children, make sure to bring all needed safety equipment for swimming. Tourists who are planning to visit Lefkada should be aware that there are no accommodations on Porto Katsiki, but you can book lovely comfortable apartment in one of nearby villages like Athani village or room in one of numerous hotels on Lefkada and easily reach the beach by your own or rented car. To truly enjoy Porto Katsiki, you should visit it early in the summer, during late May or early June, to avoid crowd on the roads and on the beach as well. If you are visiting Lefkada during summer season peak, the best is to visit Porto Katsiki during the morning hours or late in the afternoon.